For urban and country dwellers alike, a quarter acre is all the space you need to farm all the food you need! Homesteading allows you to feed your family healthy meals harvested right from your own backyard while also reducing your environmental footprint. Live off the land you have. Plant a successful and sustainable farmon a quarter acre to a full acre and beyondwhere you can raise your own fruits, vegetables, chickens, bees, milk-bearing animals, and more. Local, organic food is attainable to you at a fraction of the cost with your own self-contained operation. Angela England runs her familys successful, small-scale farm, and she teaches you how you can do the same. Backyard Farming on an Acre (More or Less) guides you through the essentials of planning a small farmdecide what should be grown or raised, and implement proven and sustainable homesteading techniques. Learn everything you need to know to maximize your space, yield, and harvest. Its not glamorous, but it is rewarding, so prepare to get a little dirt under your fingernails and see what kind of gardening and farming magic youand your land!are capable of. 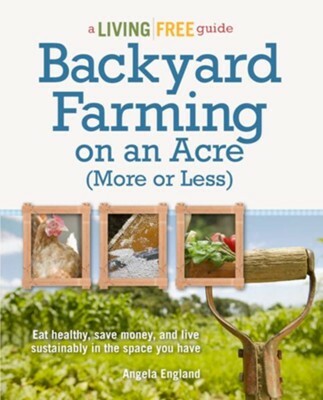 Angela England is the author of Backyard Farming on an Acre (More or Less), a Living Free guide, and a freelance writer who, along with her husband and four children, cultivates a half-acre farm in their backyard. Here, they manage to raise diary and meat goats, keep enough chickens for eggs and free-range poultry, and foster an intensively productive garden for fresh fruits and vegetables. With dirt under their fingernails, they started by cultivating a small garden and eventually took on chickens and goats. With time, their garden grew, and they expanded to parent bees, fruit trees, and a larger plot, while shedding the conveniences of urban life. Angela is the Plants and Bulbs feature writer at Suite101 and founded the Untrained Housewife website in order to guide others in recapturing the lost arts of rural living. She also manages and maintains the Blissfully Domestic community with an additional 300,000 page views monthly and contributes to other sites and forums on a regular basis. She lives in Catoosa, OK. I'm the author/artist and I want to review Backyard Farming on an Acre (More or Less).